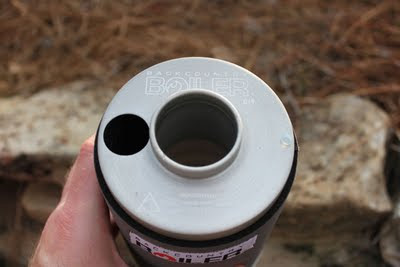 I recently had the chance to test Devin Montgomery's Backcountry Boiler. 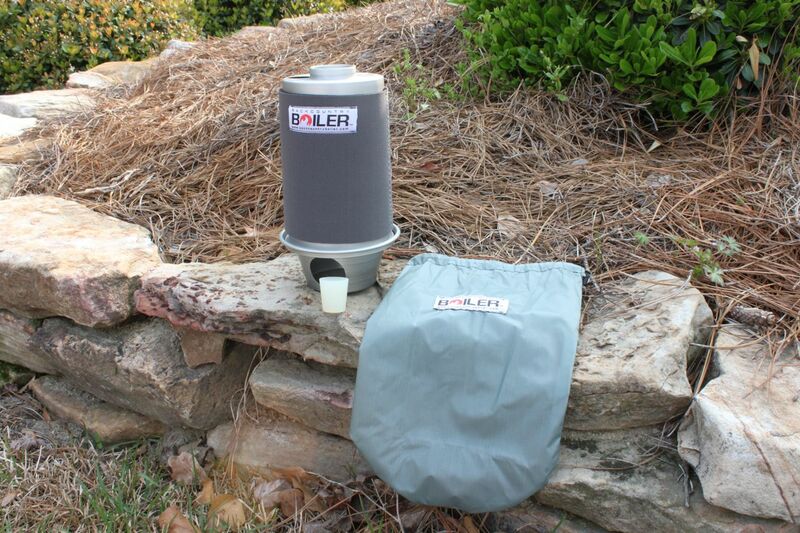 His new system is the first truly backpacking worthy boiler on the market. 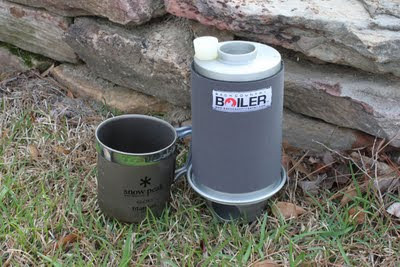 Boilers like this are an interesting alternative to traditional backpacking stoves because you don't carry fuel with you. 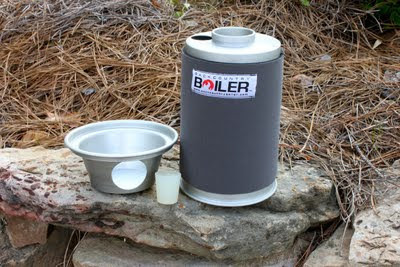 Boilers burn small twigs so in most circumstances the next campsite will have the all the fuel you need. The boiler comes with the fire bowl, the boiler, a neoprene insulation sleeve, a silicone stopper and a stuff sack. The entire system weighs 9.7oz (277g) on my scales and is only roughly twice the size of a SnowPeak 600 mug. So how does it work? Water in the boiler is heated by a small fire in the base of the unit. 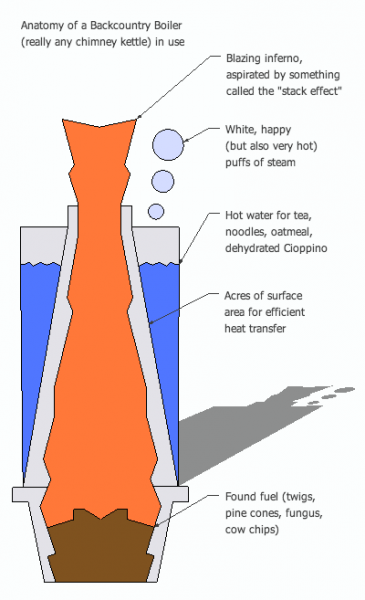 The heat is transferred to the water via the conical chimney (see illustration below). After getting a fire started, you place the boiler on top and feed the fire through the chimney as needed until you reach a boil. I was able to bring 2 cups of 50F (ish) water to a rolling boil in about 6.5 minutes. The Boilerwerks website states that a skilled operator can get a boil in under 5 minutes. Anatomy of a Boiler. Courtesy of Devin Montgomery 2010. The design and construction quality of the Backcountry Boiler are very good and far better than you'd expect on a first production run. It includes thoughtful features like hard coat anodization for increased durability. Devin even chose to laser mark his logo and a safety warning on top of the boiler. Nice touch. Naturally, burning wood creates a coating of creosote on the surfaces exposed to fire. With the boiler's design none of this is on exposed surfaces meaning its unlikely that you'll get the mess on your hands and other gear. It does carry a heavy woodsmoke smell after use so I'd want to carry the boiler on the outside of my pack to prevent soaking my gear (bag, quilt, tent, spare clothes) with that campfire smell. The neoprene sleeve does a good job of insulating your hands from the heat of the boiling water. I expected it to offer very limited hold time based on the thin neoprene that Devin used (approximately 2mm). This turned out not to be an issue at all, fortunately. Pouring the boiling water into a typical boil in a bag meal pouch was a learning process for me. If you commit to the pour you won't have problems. Pouring slowly was a little problematic as the water tended to run down the side of the boiler making the process a bit messy. As mentioned earlier, this is well thought out gear. It works as advertised and will last a lifetime. 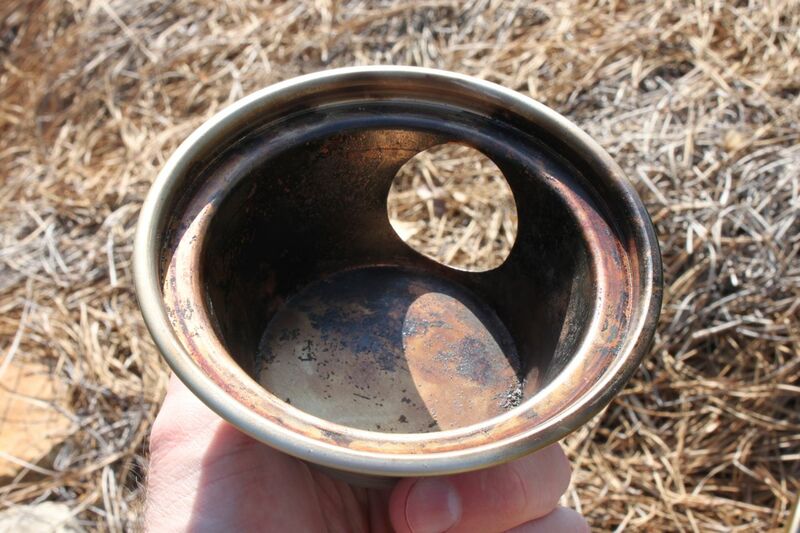 Getting water to a boil is dead simple and it uses fuel that is typically very easy to find. Devin should have a second round of boilers available soon. You can keep track of his progress on Facebook or Twitter. BackpackingLight.com will let you know when stock is available to ship if you sign up for the notice. Remember, support cottage gear manufacturers! Nice piece of kit, indeed. I am still struggling to get the rolling boil near five minutes. The pouring of the water is a little tricky. I have found out that if you remove the small silicone stopper, the water comes out more steadily. If I may share some cook kit ideas as well. 1) Sub-2 ounce titanium foil wood stove. 2) 2.3 ounce Venom energy drink pot, alternatively works superbly with 750-900ml Snowpeak or other narrow bottom pots if you prefer. 5) Titanium Light my fire phoon (spork on one end, spoon on the other) weight ??? (ridiculously light). 6) fuel = no weight, I usually find myself collecting a little bit of tinder and/or some favorite sources of fuel like bits of shagbark hickory before I camp in the evening. I call it being a "wood gourmond". Absolutely love it. 7) A little smoke is the best bug deterent ever. Way, way better then deet. Fire usually smokes a little at start but after that burns extremely clean. Occasionally I add some damp materials to it to create a little smoke to keep the bugs at bay if it's running to smokeless. 8) intangibles: nothing beats sitting around a campfire in the evening, great light source, campfire ambience, very small fuel consumption means little wood gathering, yet big enough to be low maintence to keep loaded for extended periods. Tiny ecological footprint / easy to remove or cover all trace. 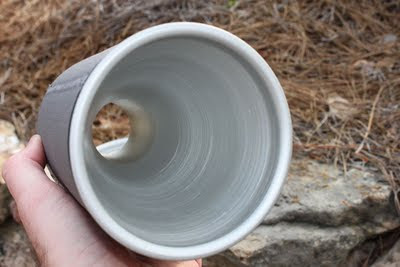 9) can boil two cups of water in 2 minutes flat! Amazingly since you put the pot right in the fire and the fire is all around it you can litterally boil water in seconds. Extremely hot. Of course you need to account for initial start time which is a little longer then an alcohol, iso or multi-fuel stove, but after started it's way hotter. It's the efficient shape and critical diameter which give it the right ratio of heat vs. fuel. Best use: sitting around the fire on a cool evening and keeping the coffee warm by setting it right back in / on the fire between sips. Mine has been trouble free. In general the carry a great quality and attention to detail reputation. Devin @ Boilerwerks is a great guy and has a lot invested in his business. I'm sure he'll do the right thing for you. Still, it stinks that you got a defective one.